So, looking at the launcher more closely, we can see a list of installed software on this computer, for me it’s Avira Antivirus Pro and System Speedup Pro, which are a part of the Avira Optimization Suite. We can also see a list of devices registered to my account, which is relevant, since some Avira licenses support multiple devices. And we can see the licenses applied to my account, again, in my case it’s the Internet Security Suite. But, looking back at the list of available software packages we can see more modules, like the so-called Phantom VPN or SafeSearch Plus. Clicking on the entry we’ll see a pop-up window describing this modules functionality in detail, and even providing screenshots, which is really handy. So, it’s time to move on to the main attraction, the Avira Antivirus Pro. You can open it by either clicking “Open” in the Avira window, or by right-clicking the Avira icon in the system tray, then clicking “Manage Antivirus”. Pretty handy. The Antivirus window is split into sections called “Status”, “Scan”, “Modules”, “Quarantine” and “Activity”. The status section is the one you’re probably going to interact with the most, so it’s the most simple one. It offers you the most crucial information like whether or not your machine is safe, whether or not the antivirus is up to date; whether or not the basic functionality of the software is active – you get the idea. Here’s what the notifications look like, as you can see here, the Avira Antivirus is telling me I have to update the databases. But, it’s not just information that the status screen offers you, you can also turn features on display on or off, so, if you need to copy some files that might accidentally trigger the antivirus, you can easily turn Real-Time protection off for a short period of time, and then turn it back on again. And, of course, you can also run a quick scan of the system. If your needs are a little more specific, however, you’ll have to use the other sections, like the “Scan” section, for example. Full scan will go through every file on your system, checking them for possible viruses; a quick scan will only go through some specific folders related to the operating system, the ones most crucial to the security of your computer; and a custom scan will either scan the folders specified by you, which is useful for some file management workflows, or scan for very specific security threats, like rootkits, for example. Actually, this last feature that scans for very specific threats is one that not a lot of antivirus software provides, I’m glad Avira included it in this release. And finally, the scheduler combines the rich feature set of a custom scan with, well, a scheduler. 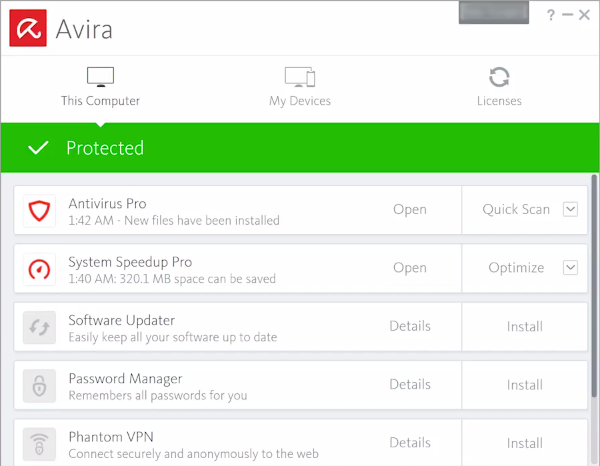 You can make Avira run specific types of scans when you want, so if you want to be 100% safe, but need high performance at specific times of the day, schedule a full system scan to run at night! The modules section is basically the same menu as the Status section, so here you can toggle specific security modules, and adjust their settings. So, if we open the settings for real time protection, we can adjust which file types are subjected to the scan, so you can potentially decrease your security risk by adding more file extensions in that list, or increase performance by removing filetypes you’re sure you’re going to be careful around. You can also disable monitoring network drives, allowing them to hibernate and thus increasing their lifespan, or enable scanning archives and customize which archives the antivirus will scan, which is handy, since some heavy archives may slow your system down when archive scanning is activated. Stuff like which actions the antivirus should take after finding an infected file is also something you can customize with Avira. Moving on to the Firewall settings, we can enable blocking all incoming connections, which might be handy for some very specific web tasks; and specify application rules in the official Windows Firewall. The quarantine section will show you files that were put in quarantine after a scan or after a real time protection system was triggered. Here you can see the exact type of threat Avira “busted” the file for, the date it happened, and you can also decide what to do with the file, with “delete”, “restore” and “rescan” being the options offered to you. The activity section shows you all the tasks the Antivirus has done recently, like starting and finishing scans or updating the software. If you are an especially active antivirus user, you can filter the journal by task type and time – really handy! So, as you remember, the Avira Optimization Suite 2018 also includes Avira System Speedup Pro a piece of software designed to accelerate your PC startup times, achieve smoother web surfing and faster loading, let’s take a look. Again, in order to open any of the Avira software, all you have to do is launch the Avira Launcher, then choose the needed software package. The “device optimization” section deals with general slowness of your computer that’s usually caused by fragmented files and broken registry entries and fixes these problems. The boot optimizer looks for unnecessary startup services and safely turns them off, effectively speeding up your boot time. The Power Modes section controls the Windows built-it power management functions, that control which processes get most attention from the CPU, essentially either expanding your battery life, or increasing performance, depending on what you choose. Contrary to popular belief, this feature set is not only used on laptops, it’s also used on stationary PCs. The game booster searches for your installed video games and allows you to increase their performance by focusing all the PCs resources on the game process and closing unnecessary background services. And the Ultra Boost offered by Game Booster creates a virtual drive in your RAM to speed up your load times to the point where they’re almost instantaneous! Keep in mind though, this feature requires a very beefy PC to begin with. After taking a close look at the Avira Optimization Suite 2018 I can see that the overhauled user-interface and the implementation of the launcher has done a lot to streamline the user experience; and combined with an already excellent security modules of Avira Antivirus Pro and optimization features of System Speedup Pro, the Avira Optimization Suite makes for an amazing software package.